Balsamic vinegar is one of my favorite condiments because it can be used in either sweet or savory applications. It's also a great way to impart flavor to vegetables as a dressing or marinade. To jazz up some vegetables that I wanted to serve as a side dish for dinner, I tossed them with a bit of extra virgin olive oil and balsamic vinegar before roasting in the oven. It' a great way to add flavor and be easy on calories! In a baking dish, place your vegetables. Drizzle with the olive oil and balsamic vinegar. Toss the vegetables to coat and season with salt & pepper to taste. 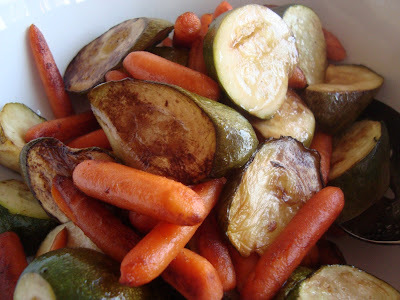 Bake the vegetables in the preheated oven for 20 minutes; remove and serve hot.